This article is about the microgame from WarioWare: Touched!. For the actual game, see Flagman. Info "Pay attention to the order that the flags are waved, and then repeat it!" 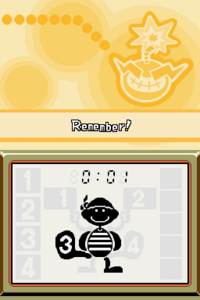 Game & Watch Flagman is a microgame found in the Retro Action stage in WarioWare: Touched! It is based on Flagman in the Game & Watch series. The objective is to watch how the guy shows the numbers. The player should repeat what he did by tapping on the spots on the guy's flags or feet. The player must score 20 points or more to clear the microgame. 1st level difficulty: 2 numbers are shown. 2nd level difficulty: 3 numbers are shown. 3rd level difficulty: 4 numbers are shown. Use the stylus to press on the guy's flags or feet. This page was last edited on February 16, 2018, at 17:31.